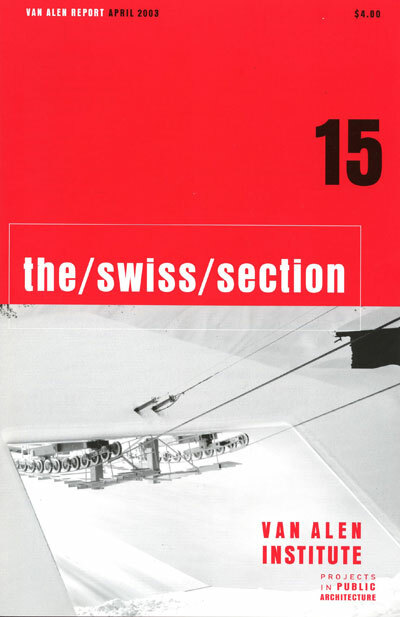 The Swiss Section exhibited at the Van Alen Institute in 2003 investigated contemporary Swiss architect’s approach to designing infrastructural projects including rail, energy, and transport facilities, bridges in the Alps, and a switching station in a dense city. The architectural section both provokes and provides a topological area of work for architects in Switzerland who are challenged designing projects that often traverse valleys to mountains and cities. Themes such as “above,” “below,” “across,” and "through" organized the projects. The exhibit also presented the concept from the study of Switzerland as “Stadtland” or City-Country from the organization Swiss Avenir, ia critical discussion and analysis by planners, economists, sociologists, and architects such as MVRDV. Projects by Herzog & de Meuron, Bernard Tschumi, Gigon/Guyer, Jurg Conzett, Miller & Moranta, Morger and Degelo, Christ and Gantenbein, EM2N, Devanthéry and Lamuniere were included in the exhibition, which was part of the Swiss Peaks festival. Inge Beckel, Swiss architectural journalist, was curatorial consultant. David Reinfurt was the graphic designer and Frederic Leverat the exhibition designer.